In order to evaluate the role of vegetarianism in diabetes we shall review the current dietary recommendations in diabetes. We shall further examine the suitability of vegetarian foods in composing such diets. Diets prescribed for diabetics have gone through remarkable changes in the insulin era, post-insulin era, and most importantly in the last two decades. Diets in the pre-insulin era consisted of a very low carbohydrate content. In insulin-dependent diabetics, the carbohydrate content was reduced to 10-20 gm/day. Thus, in order to provide the requisite amount of calories the fat content of the diet had to be proportionately increased. Such diets were highly unpalatable. Diabetic diets in the post-insulin era derived 40%, 20% and 40% of their calories from carbohydrates, proteins and fats respectively. This has further changed in the past two decades. The present day diabetic diets derive 50 - 60% of their calories from carbohydrates and proportionately reduced amount of calories from fats (Table 1). Diets in India, where vegetarianism is practised extensively, have always been high in carbohydrates and low in fats. * p/s: is the total intake of polyunsaturated fat divided by the intake of saturated fat. Currently prescribed diabetic diets are high carbohydrate, high fibre, low fat diets. The amount of saturated fats is usually half of the total fat intake. We shall examine how an optimal diabetic diet can be derived from vegetarian sources. Traditionally, diabetes mellitus has been treated with a low carbohydrate diet because of the misconception that carbohydrates will cause an increase in the blood glucose levels. As early as 1935, it was reported that carbohydrate tolerance in healthy adults was improved by an increase in the proportion of carbohydrate in the diet. By 1960, it was appreciated that rural Africans eating a traditional high carbohydrate diet had low fasting blood glucose levels and reduced plasma insulin responses to glucose loads as compared with a matched group of whites. Although all dietary carbohydrates provide the same amount of energy (as measured by kilocalories), they are not all handled with equal efficiency by the body. The blood glucose response to various foods of similar carbohydrate content varies widely (Table 2). These variations are attributed to the variable quantity and quality of fibre contained in these foods. Soluble fibre tends to lower the glycaemic index more effectively than insoluble fibre. The glycaemic indices are further influenced by the processing and cooking methods. For example, ground rice has a higher glycaemic index than whole rice. Mixed meals produce variable glycaemic responses because of the interaction between starches and other nutrients. It is important to appreciate that 55-60 per cent of the energy requirements can be derived from the complex carbohydrates contained in cereals and pulses. This does not present any difficulty in achieving control of diabetes, both in insulin-independent and non-insulin dependent diabetics. This was well documented by many Indian investigators much before the resurgence of interest in high carbohydrate diets in the western countries. It is further advantageous to combine cereals and pulses, as is traditionally done in a vegetarian diet. our own data con firms that this produces a lower glycaemic index, partly due to the high dietary fibre content and partly due to an increases insulin secretion following ingestion of a pulse-based diet. The mixing of cereals and pulses also removes the imbalance of essential arnino-acids. Cereals are limiting in Iysine and pulses it methionine, thus, when both are taken together, their amino acid compositions complement each other, producing a protein mixture of fairly high biological value. Not just cereals ant pulses, but proteins from all vegetable food sources also cornplement each other (Fig. 1). The edible, but indigestible, component of plants contain two types of fibres: soluble and insoluble. Chemically, the fibre in plants is either cellulose and lignin which are insoluble or noncellulose polysaccharides like hemicellulose, gum and pectin, which are soluble. Although many diet plans take the crude fibre into account, it is important to study the total fibre content and its soluble and insoluble components(Table 3). a= Crude fibre,g/100 edible portion, method of Weende. in Composition of Foods (Agncultural Hand-book No.456'. Washington. D.C.: U.S. Department of Agriculture, 1975.
b = Total dietary fibre. Southgate method. D.A.T. Southgate et al. J.Human Nutr. 30: 303 - 313, 1976. The soluble fibre forms a gel in the gut and retards the absorption of most nutrients. It effectively lowers the glycaemic indices of foods. Its prolonged use lowers the blood lipids. The insoluble fibre is fermented by the gut bacteria. It maintains normal gut flora and also contributes to the increased faecal bile excretion along with pectin and other soluble fibres. The fibre content of diets in western countries varies from 5-25 gm/dav. In African countries the fibre content is as high as 75-150 gm/day. In Asian countries, usually 25-50 gm of fibre is ingested per day. Probably, an intake of 30 gm/day is adequate, which is easily achieved in vegetarian diets. This effectively lowers the blood glucose and lipids, and assists in weight loss. A high fibre diet also has important effects on metabolism in the liver, as it reduces the urea synthesis by the liver. The high fibre vegetarian foods also contain phytates and lectins. These substances reduce the rate of digestion of starch and thereby diminish post-meal hyperglycaemia. Tannins contained in these foods may have a similar effect. The vegetarian diet is generally a high carbohydrate-high fibre diet. It usually contains the recommended amount of fibre intake of 10 gm crude fibre or 50 - 60 gm of total fibre per day. It is unwarranted to supplement it with any other fibre. For research purposes, guar gum has been used extensively as a fibre supplement in diabetics. The results have mostly been gratifying in both insulin-dependent and non-insulin dependent diabetics, with an occasional study reporting the failure of guar gum in reducing post-prandial hyperglycaemia. It is always more pleasant to ingest a high fibre diet in the form of high fibre foods instead of a fibre supplement. Ingestion of fibre in excessive amounts can result in flatulence, abdominal distension and diarrhoea. It may also result in malabsorption of many micronutrients like calcium, iron, copper, magnesium, phosphorus and zinc. The currently prescribed diabetic diets are low fat diets; only about 25-30 per cent of the calories being derived from fat. The fat intake in our diet occurs from two sources; visible fat and invisible fat. It is easy to control the quantity of visible fat ingested. Most vegetarian foods contain intrinsically a very low quantity of fat except the nuts, seeds, whole milk and its products. It is easy to separate out the milk fat and hence control the overall amount of fat eaten in a vegetarian diet. The nonvegetarian foods carry various amounts of invisible fat with them; which progressively increases from lean meat (fish and chicken) to medium fat meat (ham, egg and beef) to high fat meat (corned beef, pork, cold cuts). One ounce (30 gm) of lean meat, medium fat meat and high fat meat contains 3, 5 and 8 gm of animal fat respectively. For a vegetarian, the only source of animal fat is milk products. By using skimmed milk and its products such as curds, cottage cheese or paneer made from skimmed milk, the vegetarian can minimise the amount of animal fat ingested. Vegetable fats are used for cooking by both the vegetarians and non-vegetarians. It is advisable to derive half of the fat intake from saturated fats and the other half from polyunsaturated fats. Alternatively, one-third of the fat intake can be derived from each group of fats, i.e. saturated, monounsaturated and polyunsaturated fats (Table 4). A vegetarian can easily accomplish this goal by using small amounts of butter or cream with bread or chapati and by using polyunsaturated oil for cooking. Such dietary approaches involving a low &t diet containing polyunsaturated fats have resulted in a hopeful trend towards lowering of the incidence of coronary artery disease in U.S.A.Such dietary trends are easy to achieve in vegetarian communities. Animal fat (contained in meat products), dairy products (ghee, butter, cream), coconut oil. Foods of vegetable origin also contain certain metabolically active compounds which act on specific tissues. One of such compounds is myoinositol, which is deficient in a diabetic with peripheral neuropathy. Hence, ingestion of vegetarian foods containing myoinositol can improve peripheral nerve function. The vascular complications of diabetes are ascribed to an increased generation or deficient removal of free oxygen radicals, which have the potential of damaging various tissues. Our own research shows that in uncontrolled diabetics, certain enzymes required for the removal of free oxygen radicals are functioning poorly. This situation improves with good control of diabetes. Treatment with known antioxidants, like vitamin E, which also has the potential of removing the free oxygen radicals has thus far produced disappointing results. Vegetarian foods like fruits, vegetables and spices contain large amount of bioflavonoids, which have the capacity to mop up the free oxygen radicals. The commonest misconcept regarding vegetarian diet is that it may be deficient in protein. It is important to appreciate that the quantity of protein intake will be sufficient if a diet of adequate caloric content is prescribed. On the other hand, a hypocaloric diet, irrespective of its high protein content will produce a negative nitrogen balance and loss of body proteins. 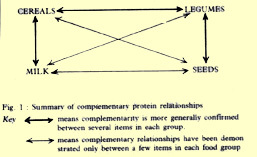 Qualitatively, vegetable proteins from a single source possess a low biological value. A vegetarian diet obviates this difficulty by incorporating about 10 gm of milk protein in diet. Alternatively, a cereal pulse mixture provides protein of a fairly high biological value, which approximates that of animal protein. To summarise, a vegetarian diet is eminently suitable for all non-insulin dependent and insulin-dependent diabetics. It is easy to provide a high carbohydrate, normal protein, low-fat diet through vegetarian foods. Such a diet is always high in fibre content and allows a highly selective and well regulated fat intake. This type of diet permits good metabolic control to be achieved. The hyperglycaemia, as well as hypercholesterolaemia, can be normalised or reduced significantly by such a dietary approach, thus minimising long-term complications of diabetes. Krall Leo P. and Beasar Richard S. Joslin Diabetes Manual 12th ed. Lea & Febiger, 1989.